With a rich history of more than 55 years in the business, KYKON has played a leading role in the heavy construction and infrastructure industry of Cyprus, being one of the leading contractors during the construction boom after the independence and gradually transferring its focus to becoming the leading importer and distributor of new and second hand construction machinery and spare parts for the industry. From its establishment, the company had also been importing first class second hand machinery, that were repaired in its workshop before being sold to the many customers of the company. This business has grown and with the addition of the representation of some of the leading brands of new earthmoving machinery, commercial vehicles and spare parts KYKON has grown to become the leading construction machinery suppliers to Cyprus. This is now the focus and main line of business of the company. 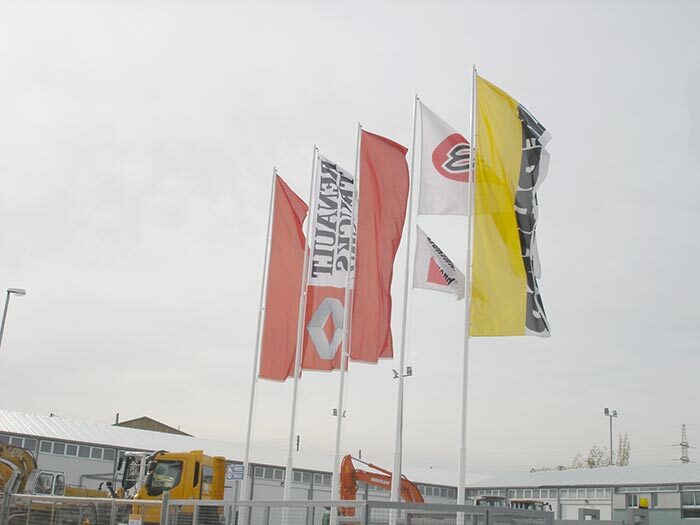 The most important dealerships of the company, which are all leaders in their respective fields, are Renault Trucks Commercial Vehicles and Trucks, LIEBHERR Earthmoving Machinery, FRD Furukawa Hydraulic Breakers and Crawler Drills and RM crushers and screens. Additionally we hold a number of very important representations in the field of earthmoving machinery and truck spare parts. LIEBHERR earthmoving machinery, of German origin, with their advanced design and technology are considered the best in the world and are able to increase the productivity of even the most demanding applications. LIEBHERR machinery have been used for years by the largest and most sophisticated construction companies both in Cyprus and throughout the world. Our company is the sole LIEBHERR dealer in Cyprus and has a full range of spare parts in stock. The Japanese high technology concern Furukawa Rock Drill (FRD) has its roots in the development of mining equipment. It is a part of the multinational Furukawa Company Group whose principal activities are the manufacture and sale of engineering machinery, electronic materials and chemicals. FRD is renowned for both its Hydraulic Breakers and its Crawler Drills. FRD boasts a long tradition of dedication to high quality, long-life and ultra-reliable products. Its range of many hundreds of machines, hydraulic drilling and demolition equipment, primarily breakers, crawler drills and attachments, in total now extends to many thousands of units sold and used across a total of some 150 countries. The company currently claims a worldwide market share of some 33% and in Europe of some 10%. The leading Commercial Vehicle Brand Renault Trucks, a French truck manufacturer, is a subsidiary of the Swedish AB Volvo Group. The company has a workforce of 13,944 people worldwide, employing 9,860 of them in France. Renault Trucks assembles and distributes an extended range of vehicles (from 2.7 to 120 t) and provides services specifically designed for road hauliers (delivery, distribution, construction, long distance), institutions, local authorities and the Armed Forces. The company designs and assembles most of its production in France (Caen, Bourg-en-Bresse, Lyon, Limoges). RM crushers and screens are extremely flexible and suitable for various applications. From the RM 60, the smart problem solver, to the high-performance RM 100GO! crusher which is in a class of its own in terms of mobile processing: robust, extremely high throughput and compact nevertheless. All of our machines can be used for Crushing natural rock (e.g. riverbed material, basalt, limestone rock, gypsum, granite and quarrying) as well as for Recycling (e.g. rubble, asphalt, concrete and production waste such as ceramic tiles). MECALAC, having acquired the TEREX Factory in Coventry UK, is now one of the leading manufacturers of Backhoe Loaders, Site Dumpers and Rollers in the world. Building on over 55 years of Backhoe expertise and 60 years of Site Dumper experience the MECALAC range of backhoe loaders and dumpers are designed to be rugged, versatile and highly productive. Our company is also the main supplier in Cyprus, and also exports to several countries around Europe and the Gulf, of spare parts for most Earthmoving Machinery. We can offer a full range of parts at competitive prices from the best factories in the world, such as ESCO Buckets and Teeth, BERCO undercarriage parts, Fleetguard filters and several others. We are also distributors of most turbocharger manufacturers in Cyprus, including BorgWarner, Garrett, MHI, IHI and Holset.